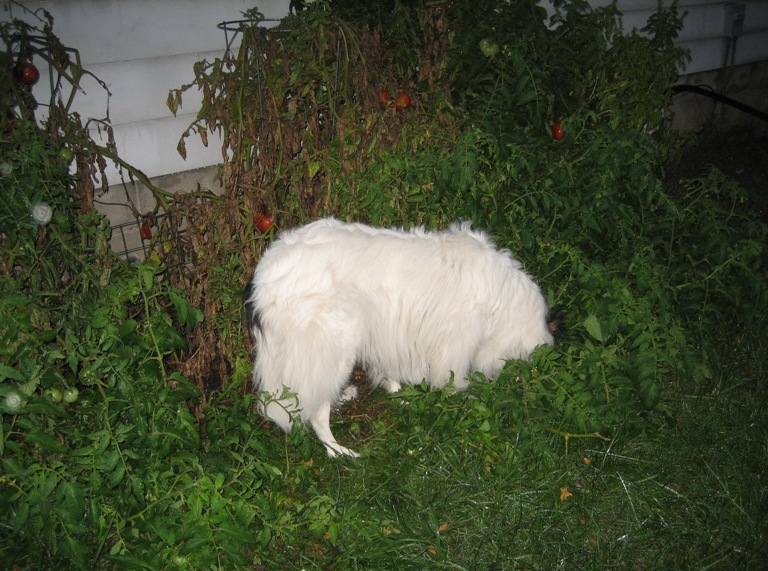 First she discovered the rotten tomatoes we’d pitched to the side of the yard. 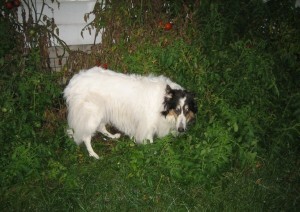 Then she started staying out longer, coming in smelling like tomato plants. Sometimes juicy seeds and flesh would fall out of her mouth as she came up the back stairs. 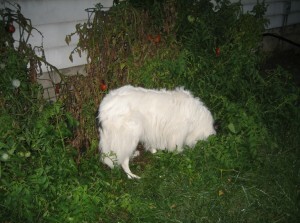 Now, instead of being sneaky, she just stays buried in the plants, eating the fruits as she finds them. Even green ones. Last week she ate David’s pajama pants and pooped out a sock immediately after, plus she has a poop-eating ritual as well, so I guess tomatoes are the least of her GI’s problems. Sneaky girl! One time a friend of mine was watching Abbs and she ate a pocket of his pajama pants. He later remembered that he’d left some candy in there. Hee! Hi Amy! The good thing about Pugs is that they will rarely eat anything less than 20 bucks a pound! Arliss sends his regards to Arliss the Rabbit!